Rainbow District School Board and 11 First Nations have renewed Education Service Agreements. 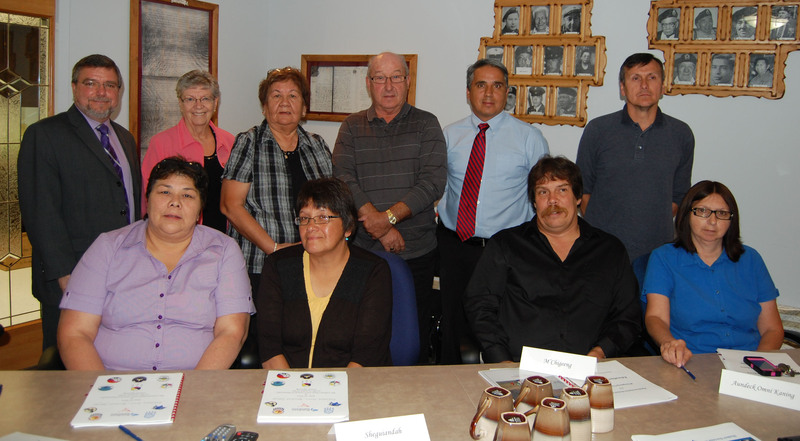 Front row, from left: Anna-Marie Abitong, Education Director, Sagamok Anishnawbek; Carol Aguonie, Education Counsellor, Sheguiandah First Nation; Brian Bisson, Counsellor, M’Chigeeng First Nation; Chief Patsy Corbiere, Aundeck Omni Kaning First Nation; and back row, from left, Norm Blaseg, Rainbow District School Board Director of Education; Doreen Dewar, Rainbow District School Board Chair; Trustee Grace Fox; Robert Pitfield, Wahnapitae First Nation; Chief Franklin Paibomsai, Whitefish River First Nation; and Chief Steve Miller, Atikameksheng Anishnawbek. Rainbow District School Board and 11 First Nations have renewed Education Service Agreements. The Rainbow District School Board’s First Nation Advisory Committee (FNAC), with representatives from each of the First Nations, met over the past year to review and revise the agreements. The First Nation Advisory Committee advises the Board regarding matters affecting the establishment, development and delivery of programs and services for First Nation students. “Once again, the agreements were developed with the vision and spirit of improving the educational performance of all learners and ensure that First Nations student’s Native history is respected and understood by all,” said Rainbow District School Board Trustee Grace Fox, Chair of the First Nation Advisory Committee. Seven social factors provide the guiding principles – curricular and instructional practices, organizational practices, linguistic perspectives and practices, personnel equity, school culture, school/community involvement and relations and equity of educational outcomes. Rainbow District School Board, 705-674-3171, ext. 7264.